Friday Q & A – I binge at night – Help! This question, from Alex was submitted through the comments section in response to a question about binge eating at night. I do have this same problem. I actually use to weigh 280 pounds with a size 48 waist. Then I started taking MMA (mixed martial arts) and got my diet and weight lifting down to a science with one of my great friends who is also a nutritionist. I dieted and worked out perfectly for about 2 years. I ended up getting down to 178 pounds and had a 32 size waist, abs and all. I loved it and i was so happy. Then I tried to take a break from the dieting part but still continued to exercise. I didn’t even diet that poorly and about 3 months or so later I weighed 212 pounds! So i hit the dieting again hard and got back down to where I am at now, about 180 pounds and 32 waist again. But now, its way harder for me to stick to my diet at night. I eat literally only turkey and vegetables all day every 3 hours and keep my calories under control, low carbs, and very high protein. I feel great all day and not lacking any energy even though my workouts take about 4 hours out of my day and they are high intense (lifting plus still taking MMA) But I CANT SLEEP UNLESS I EAT SOMETHING. not just anything, it has to be sweet and completely bad for me. Also anytime through the night I am up and eating or I will literally just lay there and toss and turn. I wake up in the morning feeling like crap. This is EVERY night and easily at least 1000 calories worth of junk throughout the night. I still do have calorie difference though. But working out 4 or 5 hours a day for such small losses of weight is killing me and I know its because of my night eating. It is definitely holding me back and I could really use some help on my problem. PLEASE! But if you are exercising 4-5 hours a day, your body needs complex carbohydrates. It will be so hard to sleep at night unless you give yourself those carbs, but because your body is starving for them, you wind up bingeing on them. Your body is otherwise eating itself. You say that you are working out more to compensate for more food. But if you worked out less, you would need less food. This cycle seems so hard. Is it challenging to find time outside of your workouts or space inside of your mind that aren’t thoughts about food or resisting food? You don’t need to binge on carbs every night, and you don’t certainly don’t need to start eating a high carbohydrate low protein diet. It’s not an either or prospect. However, you could be integrating lots more whole carbohydrates into your day. Turkey and vegetables won’t swing it in the long term, and you’ll probably continue to binge. I know that you did it for two years, but your body probably doesn’t want to go back there which is why you find yourself up at night eating. You might find that you’re able to go back for a week or even a month, but your body will keep on coming back to bingeing as a way to compensate for the lack of calories and carbohydrates. A way to integrate good for your foods is to be having things like sweet potatoes, yams, fruit (lots of fruit), and starchy vegetables during the day. You need to balance your diet out. More carbohydrates during the day means less carbohydrates at night. And, as I said below, no one ever got fat by eating a yam. Or even a baked potato. 1. )Integrate whole carbohydrates during the day. If you are worried about processed foods, shop in the produce aisle. You can have plenty of foods that will help rebuild your body. Think yams, potatoes, mangoes, apples, bananas, peaches, apricots, nuts, beans. 2. )Try to wind down at night. There are things that you can do, such as meditate or take a bath that will calm your body down enough to help you get to sleep. You might want to try a guided visualization to keep you on your game with food. You might also do something like soak in Epson Salt bath to relax both body and mind. 3. )Stop weighing and measuring yourself and use your milestones with MMA to monitor your progress. 4. )Try to work out less. Unless you are training professionally and have a staff to help take care of your body (physical therapist, sports med doctor, etc.) you might be overdoing it and your body will be begging for more fuel. 5. )Be kind to yourself. It sounds like you’re really harsh with yourself, and at night, when you’re tired and your defenses are down, that part of you that is like a Drill Sergeant, so disciplined and constantly self flagellating, is not on his game, so the part of you that needs to be taken care of and to be treated kindly sneaks out and binges. Try to create some moderation and evenness. Bring more levity and fun into your life. Do things that are fun but meaningless in the long term (like reading a mindless book or magazine). Integrate some kindness and some breaks for yourself into your day. 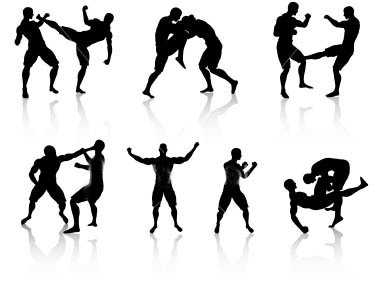 I understand that you love MMA and have been really enjoying your new lifestyle, but I’d encourage you to do other fun things and allow yourself to enjoy your life! Bringing a bit of joy can really reduce stress and just make you overall happier and lighter. I do hope that this has answered your question a bit and you’ve found this helpful. 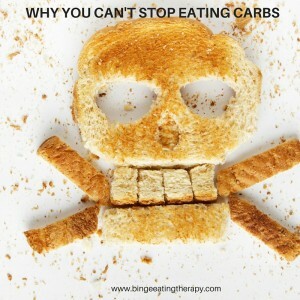 I Can’t Stop Eating Carbs! I’ve had several clients over the years come in believing this very thing, that eating carbohydrates would make them fat. So, what they would do was go on these all high-protein and high-fat diets, eating only eggs, bacon, butter, steak, water, vodka, and whatever else had very low or no carbohydrates in it for a few days, sometimes a week or two, then having a carb binge, only to beat up on themselves again and again, hating themselves for doing “the wrong thing.” Have you ever done this, or some variation on this? Well, the truth of the matter is this, you can lose weight very quickly on an extremely low-carb diet. To say that’s not true would be a lie. However, it’s a bad idea. And it almost never works. And I know that because if it did, people would go on a very low-carb diet once, lose all the weight they wanted in a few weeks or months, and never look back. Your body wants carbohydrates. It really does, and it runs more efficiently on carbohydrates and protein than on protein alone. Which is why starving yourself of carbohydrates will inevitably result in a carbohydrate binge (not to mention the strain it will put on your organs), and for most people, this isn’t usually a binge on garbanzo beans and yams, but on processed boxed foods (think Chips Ahoy, Twinkies, and Ben & Jerry’s). Let’s look at why very low-carb diets result in quick weight loss. Your body relies on carbohydrates as quick energy, when you starve your body of carbohydrates, it’s going to have to go into your fat stores to burn for energy. Theoretically this sounds great. But, most people don’t get there. This is later on, after a few days when your kidneys have let go of all the water in your body. The initial dramatic weight-loss you experience is water weight, which is why if you eat like one potato chip, and knock your body out of ketosis (a state that very low-carb dieters strive for), and you will hold onto water again and feel as though you’ve gained all the weight back that you lost. This creates a really intense cat & mouse game between you and carbohydrates. People tend to feel extremely grumpy, depressed and many experience some feeling of a cognitive decline when they are on very low carb diets long term, they have trouble with word recall, experience memory loss and battle with insomnia. If they are unable to stay on their low carb diet (not unusual) they start bingeing and feel grumpy because they’re bingeing… this is because your brain runs on glucose and depriving your brain of glucose in the form of a low carb diet can make one feel foggy, depressed, lethargic, and all around distressed. Because your brain is running less efficiently and your brain is foggy, it makes you more vulnerable to a binge. And what happens? You binge on lots simple carbohydrates – which then makes you more depressed and more apt to binge more. When you don’t supply your body with any carbohydrates, it needs to slow down to preserve energy. This is why when people dramatically restrict their carbohydrates, they find that they are unable to exercise very much at all, they find that they are constipated due to lack of fiber, and they often become nauseated from ketosis. Because glucose stabilizes serotonin levels, some folks might find that they are depressed. Because your body runs so inefficiently on a very low carb diet, you will probably find yourself rebounding at some point with a carbohydrate binge. This sets up a cycle, again and again. I had a client come in telling me, “I once lost 10 pounds in two weeks eating just steak and red wine, I know I can do it again…” and despite how much we worked on integrating healthy carbohydrates into her diet, her belief was that all carbs, in any amount were bad. So if she woke up in the morning and “accidentally” had a piece of toast with her eggs, she believed that her whole day was ruined and would continue throughout the day by eating ice cream, cake, cereal, pasta, whatever she could get her hands on, then use that as proof that carbohydrates were the problem. She would then hate herself. It wasn’t that one piece of toast that started the binge, despite the fact that she told herself that she couldn’t eat any carbohydrates because she was addicted. It was the belief that she couldn’t eat any carbohydrates and the black and white thinking that triggered the binge. She got so angry at herself every time she ate anything with carbohydrates in it and she got so angry at herself for the binges. Each time she started her diet again, she believed that this time it would be different. This time she could stick to it. Her body didn’t want her to stick to it. And when she didn’t, she blamed herself and her lack of willpower. Finally, after many, many years of this cycle, she agreed to try something different. 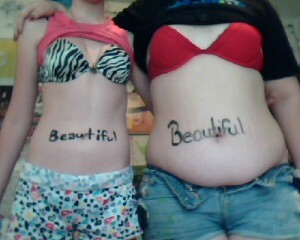 She saw that she’d been doing this for so long and now weighed more than she ever had. She agreed that for just one month, just 30 days, she’d work in some balance. “I’m still not eating pasta or bread!” she told me. “That’s fine,” I told her, “but what about some apples, some sweet potatoes, some onions and peppers, some beans…” She agreed and began bringing unprocessed carbohydrates into her regimen. She decided that for the month she would “eat anything that grew,” which was something that she’d read in Louis Hay’s You can Heal Your Life. Not forever, just for 30 days. Our start date for her experiment was April 1st of last year and she agreed to go until May 1st without succumbing to the lure of a no-carb diet. Despite the fact that she was allowing herself to eat more, each day was a struggle because she really wanted to give in to her desire to reject carbs. As we discussed it over the month, she realized that a huge part of her wanting to control her carbs so intensely was also a desire to have some control in her life. When she gave that up, it opened up more space for us to discuss in therapy what was actually going on in her life that felt totally out of control, such as her career, her relationship, and some of her friendships. As carbohydrates stopped being the center of her focus, her real life, which was admittedly difficult, became something that she was actually able to focus on in therapy. Each day in April she let herself experiment with different whole food carbohydrates, such as potatoes and sweet potatoes, yams, apples, bananas, avocados, sushi with the rice, and she even ate pasta once or twice without bingeing on it, which shocked her. The magic that happened in that month was the letting go. As she was able to work on what was really going on inside of her and allow herself to eat really healthy whole foods, she began to let go of bingeing. Those ten pounds that had been haunting her for years didn’t magically fall off in a month, but about 2 or 3 pounds did. No, it wasn’t the ten pounds in two weeks that she was hoping for, but the promise of that was what kept piling the pounds on year after year after year. As of right now, she’s not on a no-carb diet, and she’s not on a high carb diet. She is just trying to be nutritionally savvy. She eats whole foods, and exercises and has recently began to feel at peace with her body. She has certainly lost weight and come to a comfortable place for herself physically, but that’s not what makes this important, what makes it important is that when she stopped obsessing, she was able to come home to herself. That doesn’t mean that taking care of yourself by choosing not to eat certain refined carbohydrates is a bad thing, however it might be good to reframe your thinking not as a “low-carb” diet but as a “whole foods” way of eating. Allowing yourself healthy whole foods will do nothing but nourish your body. And if you wind up eating a piece of cake or some pasta once in a while, it doesn’t mean you’ve failed miserably, you haven’t knocked yourself out of ketosis and you don’t have to binge. This is just about being good to your body by choosing to bring in healthy whole foods rather than reject carbohydrates totally. Most people find that they are able to fend off bingeing much more effectively when they reintegrate both carbohydrates and proteins into their daily meals. So go ahead, eat that potato and let go of the guilt. Carbs are not the enemy, in fact they will make your brain happier, calmer and you will begin to find more peace when you are integrating whole protein, fat and carbohydrates all generously back in to your daily diet. From around the web, different wonderful resources to help you with eating and body image issues. 1.) Recovery Warriors – Wonderful Pro recovery site with podcasts, resources, and online directory of Eating Disorder professionals. 2.) ED Referral – Not all therapists know how to treat eating disorders, and not all know how to recognize binge eating disorder. If you are looking for someone who understands your needs, this is a great resource. 3. )National Eating Disorder Association– A non-profit group aimed at healing EDs. Lots of inspirational stories, as well as posted research and events. 6.) National Association of Anorexia and Associated Disorders– A non profit that provides free support groups as well as informational pamphlets and literature. 7. )Association of Professionals Treating Eating Disorders– This is primarily a Bay Area resource that provides low fee treatment for EDs. 8. )Health at Every Size– A group aimed at improving your self love and body acceptance as well as encouraging healthy eating and exercising habits without dieting or idealizing a different body size or shape. 9. )The Body Positive– An organization aimed at love and positivity toward yourself and your body. It’s aim is to help you gain self love, happiness and good health without telling you that you need to diet in order to get those things. 10. )Beauty is Contagious– Not a resource, but a wonderful Tumblr with lots of images of beautiful bodies in every size and shape. Bonus 11. )Recover- Shameless Plug! Blog with lots of different article and posts geared at helping you find ways to heal from binge eating and body image issues.